This article was originally posted on Wood Street, Inc’s blog. View the original post now. It all starts with the open. It’s likely that the end goal of your email marketing campaign is to get your subscribers to convert. Whether it’s purchasing your product, taking a survey, or signing up for an event, you want recipients to take a certain action, but that’s not an issue if no one sees your email in the first place, right? Before subscribers can take your desired action, they have to be interested enough to even open your message. Many factors can come into play when it comes to encouraging the open, but today we’re going to focus on 4 of the most effective ways to get your emails opened. I recently made the statement that in email marketing, the relationship is king. If you’re trusted by your subscribers and provide valuable information, they will look forward to receiving your emails and are more likely to not only open your email, but also click through, share, and convert. Think about it: if you receive an email that looks like spam (unrecognizable from name, questionable subject line, etc.) from a company you don’t really know, it’s much easier to hit “Delete” and move on. However, if a brand you trust (that often sends you relevant, targeted messages) sends you an email, you’re much more likely to open it and see what they have to say. 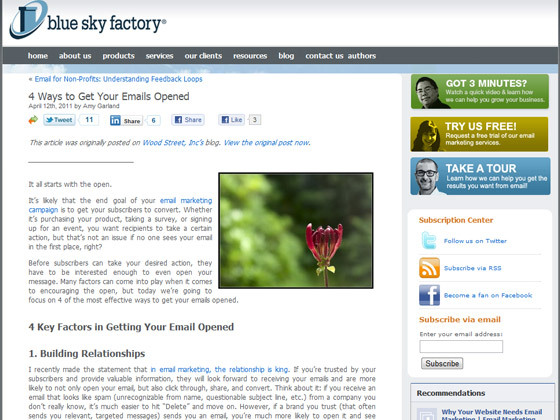 Concentrate on building a relationship with subscribers and your open rate will skyrocket. This tip includes two factors that often go hand-in-hand: frequency and consistency. First, when planning your campaigns, determine the frequency at which you will send your emails. Because your recipients are all different and may subscribe to your messages for different reasons, offer different frequency options. All them to choose a daily or weekly email option, or even offer a monthly or quarterly summary (as long as it makes sense for your business). Offer these options on your opt-in form, and then reinforce them in your welcome email and subscriber preferences center. This way, subscribers will know when – and how often – they can expect to hear from you. The key here is to be consistent. Set a plan and stick to it. If you don’t email subscribers often enough, they’ll forget they subscribed in the first place; however, if you email them too frequently, you may become a nuisance. Both of these scenarios will cause people to unsubscribe, opt-out, or mark your email as spam. If subscribers know that you email them at the same time every day or on the same day every month, they’ll look forward to hearing from you and will be sure to open your email in their inbox.